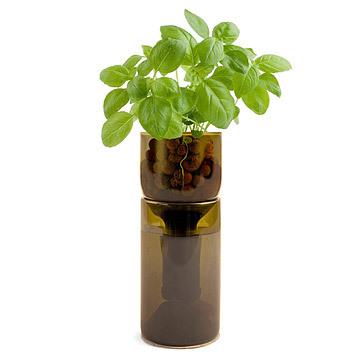 Harvest delicious organic herbs year-round with this indoor hydrogarden system fashioned from a wine bottle. How does your garden grow? Cultivate your indoor green thumb with a hydrogarden sprouting from a re-purposed wine bottle. The ideal environment for hydroponic herb-growing, allowing sunshine to permeate throughout, each set comes ready to use with soilless growing mix, wool wick, plant nutrient, cork coaster, and seeds. Choose between Organic Basil, Heirloom Mint, Organic Oregano, or Organic Parsley. You'll enjoy this product year-round, both for the pleasing modern aesthetic and all of the new recipes it will inspire. Made in Idaho from reclaimed restaurant wine bottles. Instructions included. Click here to see a grow instructions.. I love this! I want every herb in my kitchen window! This was purchased for me for Christmas. We had a tough time getting the mint to grow so we used the second packet and now it is amazing. My friend loves to cook & loves basil. Looking forward to an invite!! Loved the product! The first bottle showed up broken through the shipping process, but we called the company and they shipped a replacement right away, no extra cost! This is perfect for the Kitchen. It fits nicely on the window seal. I plan to get my Mom several so she can have fresh herbs at hand. This was easy for her and made me feel good as I'm not there to plant/tend to her herb gardens any more. I read some reviews stating that "the seedlings did'nt grow" but I ordered the Parsley unit anyway. Seedlings sprouted within 6 days and are hardy and strong. Such a beautiful, earthy way to grow herbs. My mother in law said it started out growing well but then it just stopped even though she followed all the instructions. She has a very green thumb too. Very disappointed. Really original idea being made out of a wine bottle. Great for growing your own mint especially if the person receiving it is a fan of mojitos. Fun product for someone who has everything and cooks with basil. I purchased this as a gift for my husband. We planted the seeds and were supposed to see sprouts in about 7-10 days. So far, it has been about three weeks and we have nothing but soil. I think we're going to be out of luck! I loved the idea of a recycled wine bottle, but I'm disappointed in the product and would not buy it again. A terrific way to grow herbs in the winter!